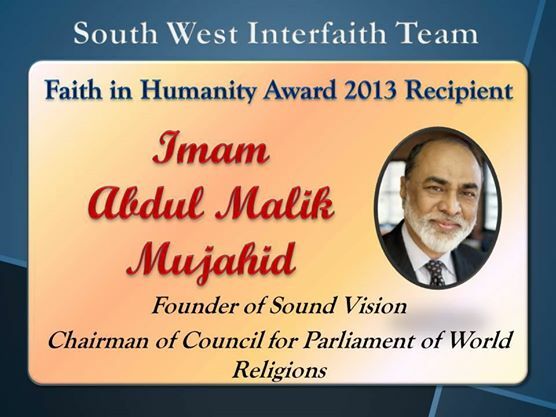 Imam Abdul Malik Mujahid is the founder of Sound Vision, and the Chairman of Council for Parliament of World Relisions. Rev. Robert Haight is the fourth winner of our annual Faith in Humanity award. Rev. Young is a retired United Methodist pastor who was instrumental in the founding of SWIFT and its early growth. 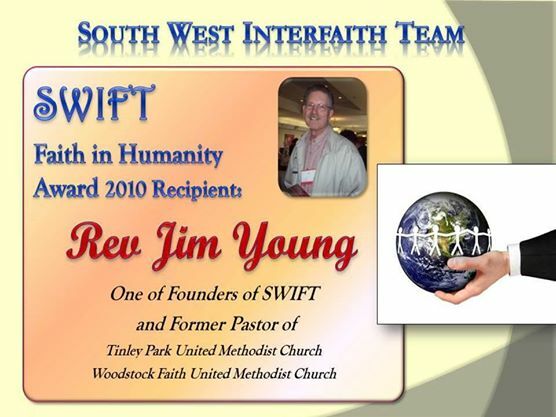 Young helped recruit several houses of worship who became members of SWIFT. As an elementary school teacher, Petersen was concerned about Muslim students fasting during the holy month of Ramadan. She organized activities so that students didn’t have to sit in the lunchroom while classmates ate and didn’t have to face teasing or criticism for practicing their faith. Rena Fulka’s journalism helped to further interfaith awareness and promote better understanding of local religious communities. One of the main goals of SWIFT is to provide a forum where people of the Christian, Jewish and Muslim faiths can come together, learn from each other, and develop a relationship based on respect, dignity and understanding. Another goal of ours is to work together on community service projects, in order to make our neighborhoods, our nation and our world a better place to live. Those who have advanced the cause of interfaith understanding, harmony and dialogue. Those who have accomplished something heroic or humanitarian, who have done a selfless act for the welfare of someone else. Our award recipients can fall into either one of these categories, not necessarily both. And of course, in keeping with SWIFT policy and rules, the award will not be politics-based. We will leave that up to other worthy organizations. In presenting this award, we wish to make a statement to those living around us that no matter what faith you belong to, an act of goodness and caring will be recognized, appreciated and promoted. We want everyone to feel the joy in their hearts that we members of SWIFT do when we see something positive and inspiring, and we want to inspire others to do the same. After all, we are calling it “Faith in Humanity” because, in this chaotic world and these chaotic times that we are living in, promoting interfaith dialogue and harmony humanitarianism restores our faith in humanity. It reminds us what human kind can aspire to do and is capable of doing… and also reminding us of what God has commanded all of us to do, which is to leave the world in a better condition than we found it in!